ACCUWEATHER GLOBAL WEATHER CENTER, Sept. 19, 2018 /PRNewswire/ -- Dr. Joel Myers, Founder, President and Chairman of AccuWeather, the largest and fastest growing weather media and business company in the world, is denouncing many of the Hurricane Florence damage estimates and impacts that were reported by the media as being inaccurate and misleading. Considered one of the nation's most respected sources on the business of meteorology, including the impact of weather on people, infrastructure and the economy, Dr. Myers has a reputation for accuracy in forecasting including his estimates of disastrous weather-related events, such as last year's hurricanes, and as such, feels compelled to refute and correct the erroneous information he is seeing in the news. "Some of the economic impact figures that were reported are ridiculous and were made based upon inaccurate forecasts or narrow analysis," said Dr. Myers. "Many so called experts quoted in the media provided estimates in a reactive fashion and did not take all factors into account, while AccuWeather's estimates from the beginning were based upon accurate forecasts predicted up to two weeks ago and consider all of the storm's impacts! We have predicted this storm further out, in more detail and more accurately than any other source." AccuWeather predicted Florence would make landfall as a Category 1 or 2 hurricane, which it did, and cause between $30 billion and $60 billion in damage. AccuWeather has narrowed the estimate of the total economic toll from Florence to $50 billion - $60 billion once all factors are considered. Dr. Myers cautions that insurance estimates should not be used as the measure of the financial impact of the storm because they don't factor in many costs such as uncovered flood damage to homes, cars, lost property and valuables in addition to lost wages and business as well as medical and other costs resulting from the inevitable disease and infection and ill health effects from mold and other problems that follow a storm of this nature. "Seeing others comment that Florence will rank among the costliest U.S. hurricanes of all time is flat-out wrong. While it was, in fact, a catastrophic storm for parts of the Carolinas as we predicted it would be, it is important to put Florence's cost and impact into historical context," said Dr. Myers. "As an expert on severe weather and its economic, financial and human costs, and adjusting for inflation, I would not put Florence in a list of the top 10 nor even the top 25 costliest hurricanes to ever hit the U.S."
For further context, AccuWeather accurately estimated the total economic impact from Hurricanes Harvey, Irma and Maria last year. We said Hurricane Harvey would result in total economic losses of $190 billion and Irma's toll would be $100 billion. Florence's projected toll will be far less than these storms as well as less than Hurricane Sandy's reported toll of $69 billion, which should likely be far higher when adjusted for inflation and factors not considered according to AccuWeather experts. It is also far less than Katrina's official cost of $161 billion, which AccuWeather reports should ultimately be twice that amount when all factors are properly considered. "The potential lingering effects of the storm should not be underestimated and will have lasting health effects on thousands of people and may contribute to their premature deaths," said Dr. Myers. "For example, last year Hurricane Harvey caused pools of standing, polluted water that remained for weeks and months and caused disease and other problems, and most likely resulted in not hundreds, but several thousands of premature deaths that are not currently being counted as Harvey-related fatalities. These kinds of long-term negative health effects should be considered for all storms going forward as they were for Hurricane Maria to show a much higher ultimate death toll than those counted during the immediate aftermath of the storm." Dangers from Florence are not over and Dr. Myers is cautioning that flooding will persist for a couple of weeks in southeastern North Carolina. Rivers are just cresting following record rainfall from Florence and standing water, heat and humidity can all lead to infections, disease, and exposure to mold, as well as produce the breeding ground for mosquitoes and other ongoing hazards. "Some of the current estimates for Florence's impact on the nation's GDP are too high," said Dr. Myers. 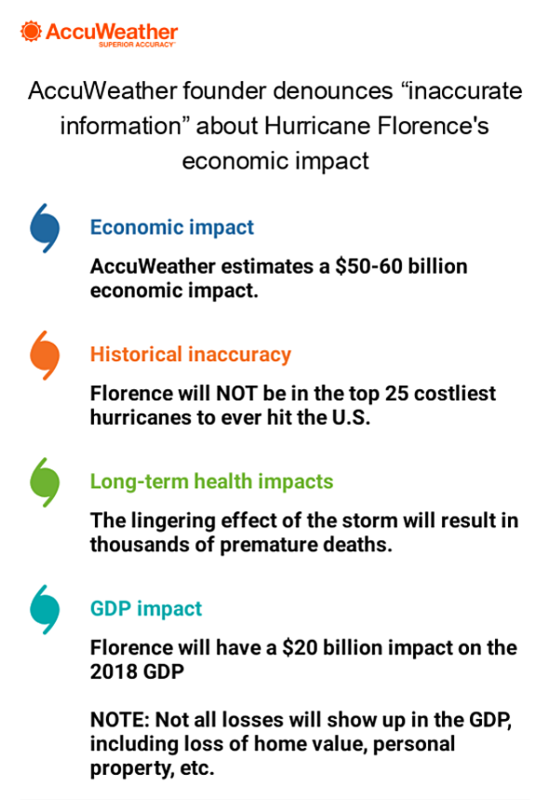 "Florence will reduce the total GDP by less than two tenths of one percent or $25 billion for the whole year of 2018; that is five to ten times greater than current published predictions of $1 billion - $2 billion." Dr. Myers stresses that Americans should not look at GDP calculations as a good measure of the impact of the storm, as they do not consider personal property losses including damaged homes, cars and individual possessions among other factors. "Despite the catastrophic and unfortunate impact on the people of the Carolinas, we should celebrate the amazing progress we have made in weather forecasting and applaud citizens for heeding warnings to evacuate as well as the quick work of the amazing first responders," said Dr. Myers. "Because of the accurate warnings, the government and brave first responders were ready and standing by to react. If Florence had hit 100 years ago with the warning capabilities we had then, I have no doubt thousands of people would have already been killed due to lack of warnings and readiness." For historical context, more than 10,000 people died in the 1900 Galveston hurricane due to a lack of warning; that number does not include the thousands of lives that were shortened by disease and premature death due to mold and other hazards. The award-winning AccuWeather apps for iOS and Android provide the most accurate, actionable weather forecasts and warnings in an innovative, advanced mobile experience personalized to each user worldwide. The app also includes AccUcast™, the only crowdsourced weather feature that provides current weather conditions and hazards submitted by users in a real-time global animation map display, plus AccuWeather Real Feel®, Future Radar, and much more. The AccuWeather app for Android phone and tablet users is free on the Google Play store. The AccuWeather iOS app is free on www.AppStore.com.